Message from H. C. with a Proclamation to apprehend the late King's Judges, &c.
To be presented to the King. Order to stay the cutting of Wood in Enfield Chace. Sir Trevor Williams, &c. Coheirs of L. Hopton. Writs for the Judges to attend this House. Danell and Sir Charles Lee. 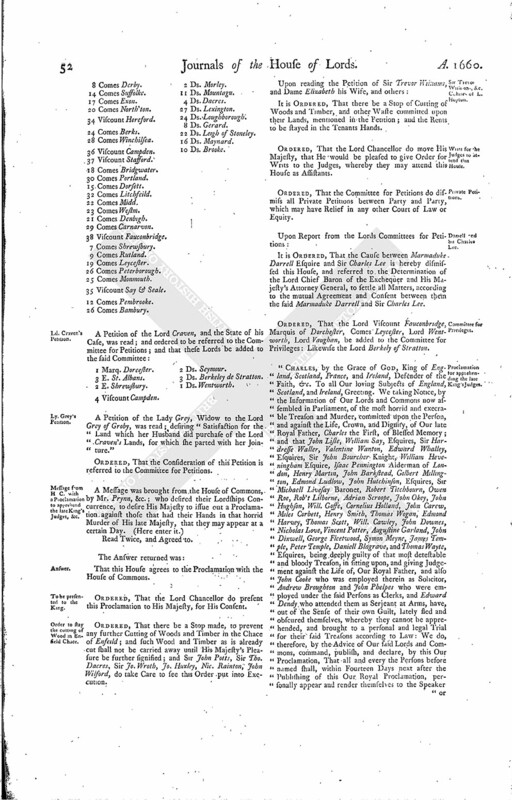 Proclamation for apprehending the late King's Judges. Pight, Solicitor, to be rewarded. Chancellors of the Universities, to see the Statutes put in Execution. Order to stay the Waste of the Estate of Sir Trevor Williams and others, Coheirs of Ld. Hopton. Order to prevent Waste on Enfield Chace. 4 Comes Manchester, L. Chamberlain of His Majesty's House. 35 Viscount Say & Seale. 26 Comes Bambury. 6 Ds. Chandos. 18 Ds. Howard de Esc. 22 Ds. Leigh of Stoneley. 4 Viscount Campden. 2 Ds. Seymour. 3 Ds. Berkeley de Stratton. 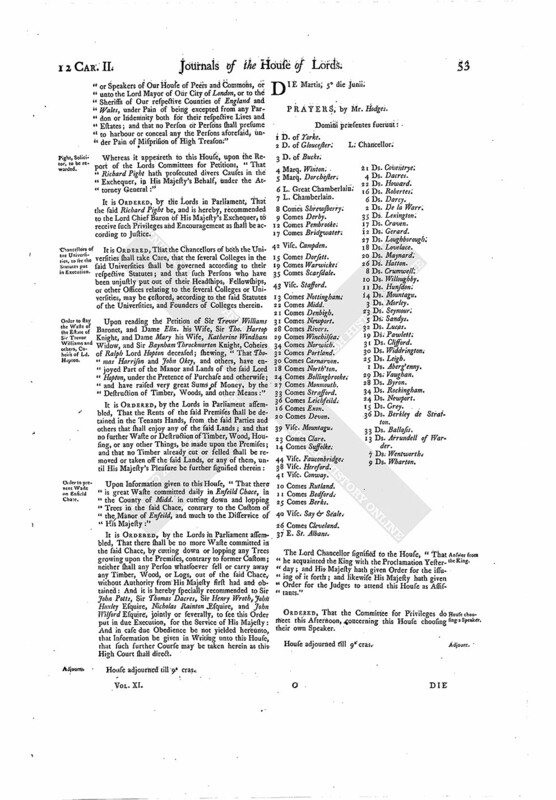 A Petition of the Lady Grey, Widow to the Lord Grey of Groby, was read; desiring "Satisfaction for the Land which her Husband did purchase of the Lord Craven's Lands, for which she parted with her Jointure." ORDERED, That the Consideration of this Petition is referred to the Committee for Petitions. Read Twice, and Agreed to. That this House agrees to the Proclamation with the House of Commons. ORDERED, That the Lord Chancellor do present this Proclamation to His Majesty, for His Consent. ORDERED, That there be a Stop made, to prevent any further Cutting of Woods and Timber in the Chace of Enfeild; and such Wood and Timber as is already cut shall not be carried away until His Majesty's Pleasure be further signified; and Sir John Potts, Sir Tho. Dacres, Sir Jo. Wroth, Jo. Huxley, Nic. Rainton, John Wilford, do take Care to see this Order put into Execution. It is ORDERED, That there be a Stop of Cutting of Woods and Timber, and other Waste committed upon their Lands, mentioned in the Petition; and the Rents to be stayed in the Tenants Hands. ORDERED, That the Lord Chancellor do move His Majesty, that He would be pleased to give Order for Writs to the Judges, whereby they may attend this House as Assistants. ORDERED, That the Committee for Petitions do dismiss all Private Petitions between Party and Party, which may have Relief in any other Court of Law or Equity. It is ORDERED, That the Cause between Marmaduke Darrell Esquire and Sir Charles Lee is hereby dismissed this House, and referred to the Determination of the Lord Chief Baron of the Exchequer and His Majesty's Attorney General, to settle all Matters, according to the mutual Agreement and Consent between them the said Marmaduke Darrell and Sir Charles Lee. ORDERED, That the Lord Viscount Fauconbridge, Marquis of Dorchester, Comes Leycester, Lord Wentworth, Lord Vaughan, be added to the Committee for Privileges: Likewise the Lord Berkely of Stratton. "CHARLES, by the Grace of God, King of England, Scotland, France, and Ireland, Defender of the Faith, &c. To all Our loving Subjects of England, Scotland, and Ireland, Greeting. We taking Notice, by the Information of Our Lords and Commons now assembled in Parliament, of the most horrid and execrable Treason and Murder, committed upon the Person, and against the Life, Crown, and Dignity, of Our late Royal Father, Charles the First, of Blessed Memory; and that John Lisle, William Say, Esquires, Sir Hardresse Waller, Valentine Wanton, Edward Whalley, Esquires, Sir John Bourcher Knight, William Heveningham Esquire, Isaac Pennington Alderman of London, Henry Martin, John Barkstead, Gilbert Millington, Edmond Ludlow, John Hutchinson, Esquires, Sir Michaell Livesay Baronet, Robert Titchbourn, Owen Roe, Rob't Lilborne, Adrian Scroope, John Okey, John Hughson, Will. Goffe, Cornelius Holland, John Carew, Miles Corbett, Henry Smith, Thomas Wogan, Edmond Harvey, Thomas Scott, Will. 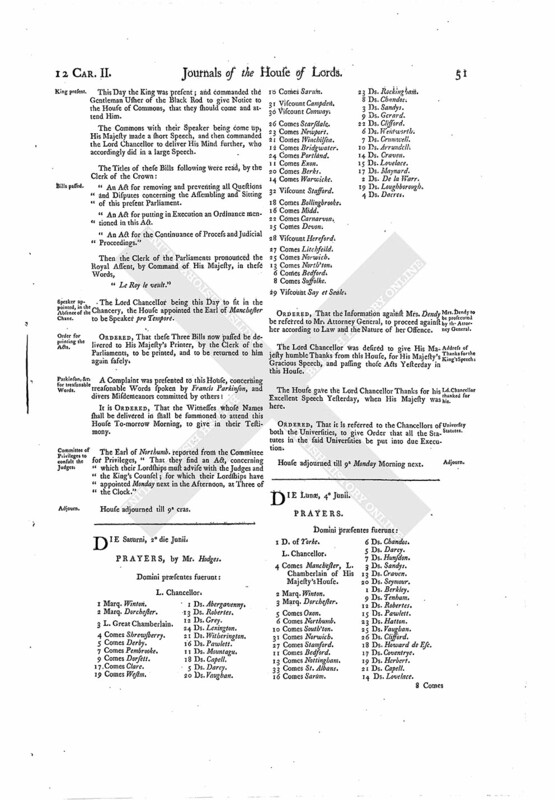 Cawley, John Downes, Nicholas Love, Vincent Potter, Augustine Garland, John Dixwell, George Fleetwood, Symon Meyne, James Temple, Peter Temple, Daniell Blagrave, and Thomas Wayte, Esquires, being deeply guilty of that most detestable and bloody Treason, in sitting upon, and giving Judgement against the Life of, Our Royal Father, and also John Cooke who was employed therein as Solicitor, Andrew Broughton and John Phelpes who were employed under the said Persons as Clerks, and Edward Dendy who attended them as Serjeant at Arms, have, out of the Sense of their own Guilt, lately fled and obscured themselves, whereby they cannot be apprehended, and brought to a personal and legal Trial for their said Treasons according to Law: We do, therefore, by the Advice of Our said Lords and Commons, command, publish, and declare, by this Our Proclamation, That all and every the Persons before named shall, within Fourteen Days next after the Publishing of this Our Royal Proclamation, personally appear and render themselves to the Speaker or Speakers of Our House of Peers and Commons, or unto the Lord Mayor of Our City of London, or to the Sheriffs of Our respective Counties of England and Wales, under Pain of being excepted from any Pardon or Indemnity both for their respective Lives and Estates; and that no Person or Persons shall presume to harbour or conceal any the Persons aforesaid, under Pain of Misprision of High Treason:"
Whereas it appeareth to this House, upon the Report of the Lords Committees for Petitions, "That Richard Pight hath prosecuted divers Causes in the Exchequer, in His Majesty's Behalf, under the Attorney General:"
It is ORDERED, by the Lords in Parliament, That the said Richard Pight be, and is hereby, recommended to the Lord Chief Baron of His Majesty's Exchequer, to receive such Privileges and Encouragement as shall be according to Justice. It is ORDERED, That the Chancellors of both the Universities shall take Care, that the several Colleges in the said Universities shall be governed according to their respective Statutes; and that such Persons who have been unjustly put out of their Headships, Fellowships, or other Offices relating to the several Colleges or Universities, may be restored, according to the said Statutes of the Universities, and Founders of Colleges therein. Upon reading the Petition of Sir Trevor Williams Baronet, and Dame Eliz. his Wife, Sir Tho. Hartop Knight, and Dame Mary his Wife, Katherine Windham Widow, and Sir Baynham Throckmorton Knight, Coheirs of Ralph Lord Hopton deceased; shewing, "That Thomas Harrison and John Okey, and others, have enjoyed Part of the Manor and Lands of the said Lord Hopton, under the Pretence of Purchase and otherwise; and have raised very great Sums of Money, by the Destruction of Timber, Woods, and other Means:"
Upon Information given to this House, "That there is great Waste committed daily in Enfeild Chace, in the County of Midd. in cutting down and lopping Trees in the said Chace, contrary to the Custom of the Manor of Enfeild, and much to the Disservice of His Majesty:"
It is ORDERED, by the Lords in Parliament assembled, That there shall be no more Waste committed in the said Chace, by cutting down or lopping any Trees growing upon the Premises, countrary to former Custom; neither shall any Person whatsoever sell or carry away any Timber, Wood, or Logs, out of the said Chace, without Authority from His Majesty first had and obtained: And it is hereby specially recommended to Sir John Potts, Sir Thomas Dacres, Sir Henry Wroth, John Huxley Esquire, Nicholas Rainton Esquire, and John Wilford Esquire, jointly or severally, to see this Order put in due Execution, for the Service of His Majesty: And in case due Obedience be not yielded hereunto, that Information be given in Writing unto this House, that such further Course may be taken herein as this High Court shall direct.